Four premium item Kellogg's "The Best to You Each Morning" cereal bowls issued in 1995. 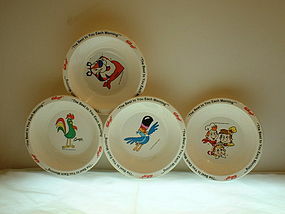 The bowls feature Tony the Tiger, Snap Crackel and Pop, Corny and Tucan. The bowls are NEW. Will accept cashier checks, money order and personal checks with UP to 10 days hold time on personal checks. Postage determined by your zip.